Schooltraq comes with a powerful API, or application-programming interface. Mobile applications, online resources, and other applications can access your courses and assignments. Schooltraq mobile applications: If you use a mobile application developed by Schooltraq, like Schooltraq for Android, you don’t need to manually enable API access or know how APIs work. Although our mobile applications use the API to access your account, they require no intervention on your part. Simply log in on your device. Exporting your data: If you’d like to take your Schooltraq data to another service, you can use the API to expose your data in a format that is easy for other applications to understand. The process is mainly targeted towards developers, however. Developers and programmers: If you are a developer or programmer, learn how to leverage the Schooltraq API in your next app or website by reading the developer guide. The official Schooltraq mobile applications and some other applications can automatically enable API access when you log in with your username and password. For other applications in which you want to avoid entering your Schooltraq credentials, you should generate an API key and provide it to that application yourself. To enable API access, scroll down to the “Mobile and API access” panel on your Options page. If you don’t already have API access enabled, press “Generate a new API key” to create a new access key. If you’d like a new API key, you can press the button to revoke your old key and create a new one. Your API key is a long string of letters and numbers that begins with stq_. You can provide this string to any applications that you want to give access to your Schooltraq information. Schooltraq mobile applications and some other applications on your smartphone can sign you in by scanning a QR code. If you have a QR code application on your phone and a camera, signing in this way is faster than typing your username and password. 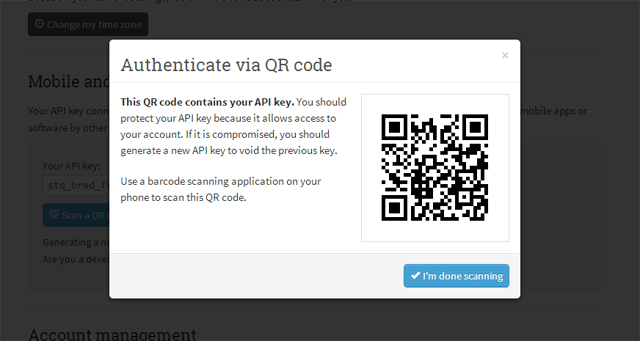 To scan a QR code, scroll down to the “Mobile and API access” panel on your Options page. Click on “Scan a QR code” to open a popup window with a QR code that you can scan. You need a barcode scanning app on your phone to scan QR codes. We recommend Barcode Scanner for Android. Applications that have access to your API key can perform a wide variety of actions on your account, including deleting assignments and courses. If you think an application with access is performing unwanted actions, you can simply create a new API key. Because you can only have one API key at a time, you will revoke access to all applications using your old API key. If you are using Schooltraq’s mobile applications, you might have to log in again.